The engine in my Plymouth PA is misfiring and is not running very smooth as well. I'm quite sure it comes from a bad ignition timing, but I have some problems to set it right. Which probably is due to my lack of experience with this ignition system. I think the “automatic spark advance” is my main problem. Somebody told me the vacuum only pulls the distributor to full advance as soon the engine fires and stays in this position? In my case this can't be, but I'm not sure if everything is OEM on my Distributor. Pulling means it will set the Distributor (clockwise) to the full retarded position and as soon the engine revs (no vacuum) it will advance the spark to the full advanced position by the internal spring in the “automatic spark advance unite” (counterclockwise). **how can it be in his full retarded position without vacuum??? Question: Should I set the Ignition timing (0.046" before TDC) in the full retarded position or in the full advanced?? I am not familiar with the vacuum advance on the 31 PA but in the full advance position the plugs should fire before TDC. So in answer to your question I would say set the Ignition timing (0.046" before TDC) in the full advanced position. The plugs should fire slightly after TDC (Fully retarded) in the crank position. This should help eliminate kick back. Logic would dictate that without vacuum the distributor should be in the full retarded position. That is with the motor not running the distributor should be fully retarded. My assumption is that any small amount of vacuum will advance the point plate to a run position. I am sure someone more familiar with your distributor will chime in. I have always been taught to disconnect the vacuum line when setting ignition timing with a vacuum advance. As far as I'm aware vacuum advance system only take control of about 5deg of advance then the centrifugal advance takes over. Not much help but its all i got at the moment. Ian makes a good point. With the vacuum advance there is also a centrifugal timing advantage created by springs and weights. This produces timing advance while the distributor is turning even at idle. This combination of centrifugal advance along with the vacuum advance gives you the timing over a full range of engine rpm. Here again I have not seen your distributor so this is all theory. PS... As mentioned in another post, these engines are old and there is a lot of slop in the mechanics. The timing method will get you a running engine. Tweaking the distributor in one direction or the other to smooth out the engine speed over your driving range would be something beneficial to try. I tried everything with the ignition, so I’m not that sure about the ignition problem anymore. I think it's time to pay more attention to the carburetor. It's a Carter BB-1 - 245SD ( 2 3/8” Stud Centers – Throttle Bore 1 7/16” ) and I'm trying to get another Carb just to see if the problems are more on the fuel side. Ian, from your Post (October 15, 2013, 03:18:42 AM) do you know which carburetor are on your car? Is it a Stromberg? I’m sure you guys know some more, I would very appreciate if you can post them?? PS: Chet, I did a complete restoration on the Engine, so it should be mechanically okay. Happy Easter to you also. In your first post you said the engine misfires. Based on you statement about the rebuild could you have a bad distributor coil ? Is the misfire occasional or is it constant and power draining ? How is the vacuum, is it reasonably steady ? Does it misfire at idle ? Bad wires or arcing in the distributor cap ? Why do you suspect carburation ? misfire is quite constant at idle. Is changing when I adjust the Ignition. You asked me why I think it can be the Carburetor, well I tried quite everything. So I don't know, just guessing and trying another opportunity. PS: Talked to a guy around here, he said he may have a “Zenith 1” for me just for testing. Sounds like you have been down every avenue. The engine you described sounds good. My assumption is that you also have a new capacitor as well as the new coil. Everything else makes it worst brings us to either spark or gasoline. I had an 8 cylinder that drove me nuts which had a new distributor cap that got a good deal of moisture in it due to a rather large puddle. Even after it along with everything else was dried out and after a close inspection, which turned up nothing wrong, the motor would misfire like it had bad wires. Like you.., I went down every path and finally changed the distributor cap because it was the only thing I hadn't replaced twice because it was new. Bingo the motor purred like a kitten. Apparently after closer inspection it appeared that it was arcing from the center point randomly to the plug points. Maybe the moisture or maybe a defective cap. To this day I always save my old working distributor cap as a spare, just in case. If you try the carb and it doesn't help, I would try a new set of plug wires not bunched together in the wire holder and a new distributor cap just because. One last quick question, anything unusually going on when this problem first showed itself. In my case it was rain. On Second thought 9 psi at idle I think is low. Have you checked the intake manifold for cracks or loose bolts. Also the carb ? My flathead 6 cyl pulls 21 @ low idle and rock steady. I am not sure with my 29 I don't think I have had the need to check it. Probably should just for a point of reference. PS... The reading I am using for vacuum is measured in inches of mercury. 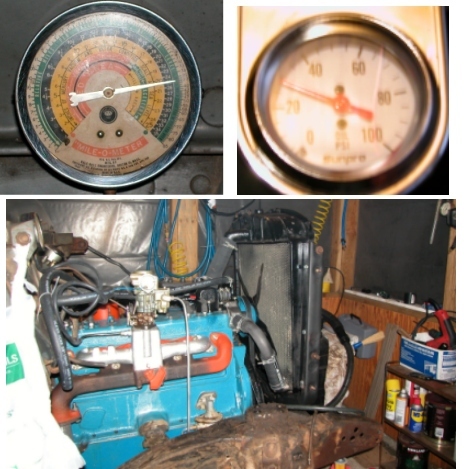 21 inch of mercury = 10.31 psi So 9 psi at idle may not be a problem if you are measuring in psi. You are right – every avenue. Capacitor is new as well!! Distributor cap is the only thing what is not new (don’t have it in spare). But a good point, will looking after one soon. I checked the Valve adjustment as well, they are not to tight. But I must admit to my shame that I haven't done it very often. I checked the valves when they were closed and followed the Owner’s Manual for Cyl. 1 and 4. I installed a new set of plug wires this morning (not bunched together in the wire holder), haven’t fire the engine yet (low battery). The “unusually” is since I bought the car, it was never running quiet good. I haven’t used the PA a lot (around 300miles after restoration), but this summer I will have him on the street as much as possible. You are right 9PSI is low, i suspect to low. Manifold is checked for cracks. Not sure about the carb. PS: The reading I am using is BAR, I converting it to psi. I added to my post "21 inch of mercury = 10.31 psi So 9 psi at idle may not be a problem if you are measuring in psi." Sorry for all the trouble but it is a good problem to get the old brain working. I've read somewhere that it should / can be 15psi = 29,53 inch of mercury. You are right, but would be brilliant if it comes to an happy end someday! Here we go, hope the link will work!! From the audio you sent it appears that the engine is responsive and accelerates when you rev it. The point being is that if it was starving for gas I think it would be hard to rev or if you tried rapid acceleration it would stall and lose all acceleration power. My car misses every now and again but not to the extent of your audio. I am sure you have checked for leaks around the intake manifold and the carburetor, all bolts snug. Maybe someone else will hear the audio and share some wisdom. To me it still sounds electrical. Something arcing lowering the sparkplug output. You don't appear to be backfiring so the mechanical timing seems correct. For these old engines the vacuum being steady confirms the mechanical timing is correct. I am still leaning toward electrical. If you are using a modern wire set your wires may be a little to resistive. Modern carbon based wires are used to suppress EMI and RFI. Solid copper or steel wires admit a lot of Radio frequency noise but provide all the maximum amount or energy to the plugs. Wires like this are generally not used on electronic ignition cars. You might find these in a speed shop. Low resistance plug wires might help. Good point Chet. "Something arcing lowering the sparkplug output." - Will try to get copper wires and check the electric circuit again!!!! You are right, everything checked for vacuum leaks. Just want to say, I very appreciate your help and time you are investing to assist me. I would be having a good look at the distributor cap. For any signs of cracks. Ignition leads don't normaly miss like that. They normaly break down on acceleration. Also have a look at the porcelain section of each spark plug for any signs of cracks. Aswell as try to narrow down the problem cylinder (s) by earthing out each plug lead. Once found start swaping components from a good cylinder to see if the miss moves as well.